We live in a consumer culture where we're constantly bombarded with advertising and marketing messages that have been carefully crafted to get us to spend money. Those sending out the marketing don't care if you have the money or not. They just want you to buy, even if it means going on a payment plan. We're told that we need to buy the newest and the best, and that if we don't we're getting left behind. We're told that the we can buy experiences or things that will make our lives better, and make us happier people. The problem is that for the most part it's just not true. Too many of us get caught in a debt spiral of spending, trying to fill holes in our lives, and we become very good at rationalizing why we're spending. Why do we overspend? There are a million different reasons. Here are some that I've come up with off the top of my head. Easy access to credit cards: Even after our nation's debt crisis,we still have relatively easy access to credit, allowing us to buy just about whatever we want, and worry about paying it another day. Monthly payments make it more accessible: It used to be that if you wanted something, you had to save up and pay cash. Nowadays you can just get on a monthly payment plan for anything from a car to a couch to a vacuum cleaner. Peer pressure or keeping up with the Joneses: We've all either been that person, or known someone who just always has to have the best of the best in order to keep up with the folks in their neighborhood, school or workplace. They buy things to be seen as successful or important. Spending addiction or spending to feel good: Some people actually have an addiction to spending money and buying things, it gives them a high of sorts. The problem, just like with drugs, the high wears off and they need to move on to the next purchase. Wanting to live “in the moment”: I've heard a lot of people talking about how they want to live high on the hog now, while they're still young and healthy. The result? They end up in a world of debt that they'll be paying until their old and gray. Wanting the best for your kids: As parents we want the best for our kids. The problem is that sometimes we can get carried away, buying all the best for our kids when it isn't even necessarily what they want or need. We buy them things to fill our own ideas of what's best for them -or to fill a void from our own childhood. Wanting things NOW: Sometimes it's just hard to have the discipline to save up for something, especially when you just want, nay, NEED, to have it now! Wanting to have the newest and the latest: So many of us are big into new technology like to rationalize buying the newest or the best technology. Others rationalize that they need to have the latest in fashion or decor. In reality we could probably get by with something less the newest and best. Not focused on long term goals: We overspend because we're distracted from or we have never focused on our long term savings and retirement goals. So as you can see there are a plethora of reasons why we overspend. We're good at rationalizing and coming up with reasons why we should be spending on things we want. It's the discipline part that gets hard. If you have other reasons that you've used for spending- good or bad, let us know what they are in the comments. So we know there are a million reasons why we overspend. The important thing to do in my opinion is to realize that you are overspending, and to then sit down and think about why it might be that you're overspending. Are you trying to compensate for hurts experienced as a child? Are you trying to appear more successful to others because of feelings of inadequacy? Do you just enjoy spending and the feeling it gives? Realizing that you have a spending problem, and trying to figure out why you overspend is a big part of starting to find a solution. 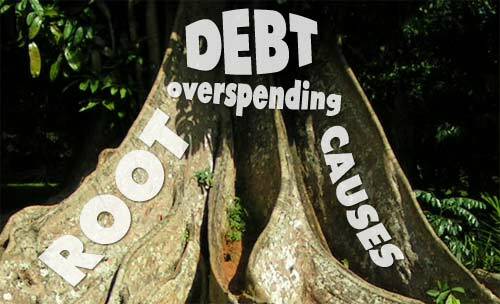 So what are we supposed to do about our overspending once we've thought about the root causes? Analyze your spending: The first thing I would suggest is giving yourself a wake-up call by actually tracking your spending. At our house when we started tracking using a software called You Need A Budget, we were shocked to find out how much we spent on several non-essential categories. Knowing where we were overspending was half the battle. Set up a budget, especially in problem categories: The next step is to actually set up a budget for your household. What we've found was especially important was to set spending limits on problem categories. If, for example, you struggle with spending in your dining out category, set a limit of how much you can spend on that every month, and don't go over. Try using a cash envelope system for problem categories. Get out enough cash at the beginning of the month to cover the category, and don't go over that amount. Start living below your means: While it may sound like a simple concept to live below your means, it can sometimes be easier said than done. But if you do want to get ahead, you'll have to start living on less than you make, otherwise you'll just be treading water, or going under. Save & Invest: Once you're living below your means and all debt is paid off, you can start saving and investing and start living! So why do we overspend? It varies from person to person, and you need to think about why it may be happening for you. Once you've figured that out however, getting back on track is probably going to involve some pretty similar steps for everyone. What tips do you have for addressing overspending? What have you done to cut back on unnecessary expenses? Is College Worth The Cost Of Student Loans? One of the debates going on right now, thanks to the recession and the rising cost of college, is whether or not your degree is worth the money. Earlier this year, outstanding student loan debt surpassed credit card debt. Rising levels of college debt, combined with a tough job market, have many questioning the cost of college. According to the COUNTRY Financial Security Index, 26% of those surveyed feel that college is no longer a good financial investment. This represents a drop from 81% to 58% of people feeling college is a good investment. Not only are more people questioning the value of college, more expect that students will help bear more of the burden. 46% of those surveyed said that they put their own retirement savings ahead of paying for a child's college experience. 78% of Americans think that college students should work part-time to help pay for college. And, of course, most people accept that public and private student loans are likely to play a big part in covering college costs, especially if college savings and scholarships don't amount to enough to pay for university. What Makes College Worth the Cost? Do you prefer a trade or professional certification? : In some cases, you might be better off attending a trade school or getting a professional certification. Not everyone enjoys college, and not everyone needs a degree in order to succeed. If you can make money as a dental hygienist, radiology tech, mechanic, or with some other profession, and you think you would enjoy it more, it might be worth it to consider going that route. Is it reasonable to assume you will make enough money when you graduate? : Your next task is to determine whether or not you will be able to afford to repay your student loans when you are done with school. Is the major you are choosing likely to allow you to repay your student loans? Part of that consideration is the school you go to. For example, will you go to a traditional university or an online school like Phoenix University? For undergrad, I went to a small state school. It was inexpensive (especially with a scholarship), and I did well. I attended a more expensive private school for my Masters (Vs. getting an online mba). My current profession allows me to easily keep up with student loan payments. Consider the costs, and whether you will be able to repay them. What experiences will you have? : In many cases, the value of your college education boils down to what you make of it. If you take the time to get involved in resume builders and network with others, this can add a layer of value to time spent in college. You can't put a price on the value of experience, connections and opportunities to grow. If you are willing to go a little off the beaten path to make your college experience a useful one, it might be worth the price you pay. In the end, you have to decide whether or not college can help you meet your career and income goals. If you find that college is worth the cost of student loans, and you can keep your borrowing prudently under control, you might come out ahead in the end. The most important financial asset that exists isn't gold, cash, or even stocks — it's knowledge. Give a man a strong understanding of finance, investing, and economics, and he'll be much more likely to succeed in the material world than if he didn't have that knowledge. In this post, let's take a look at one of the most neglected branches of human knowledge — a topic that should be exhaustively covered in high schools, but unfortunately is — economics. More to the point, let's analyze three principles of economics that everyone should understand, whether you're involved in central planning or just budget planning. 1. Trade Offs: There's No Such Thing As a Free Lunch. In order to go to college, for example, one might nee to give up 4-5 years, possibly tens of thousands of dollars, accept debt, live in cramped spaces, and go without concistent sleep for literally years. It might be a wonderful decision — especially if it's an Ivy League college — but it still requires trade-offs. Being honest about the tr`ade-offs and the real costs of everything we do, have, and spend money on. This is important, because it allows us to focus on our real priorities. For example, what's more important: earning extra money we don't need, or spending time with family? Earning extra money for retirement, or living a luxurious lifestyle that cuts away at savings? Being honest about our priorities, and understanding that everything “costs” something, we're more likely to pick actions that lead to the most possible gain for ourselves and our families. 2. Supply and Demand: If You Build It… They Still Might Not Come. This is probably the most important issue of economics. If there's a large enough demand, and it's theoretically plausible to fill that demand, then the supply will be filled. This all works on a curve of course. For example, why do some people decide to work at McDonalds? It's not a great job, now is it? The answer is in supply and demand — several layers of it. There's not a greater supply of better jobs, but there is a large enough demand for money that people who don't like the place will end up working there. An old economist once joked that you could train a parrot to squawk “supply and demand” and that it would be able to answer every economics question asked of it. That's pretty close. Why do American keep voting for a congress that they don't really like? Supply and demand. Why do people not work out even though they keep planning on it? Supply and demand — they have other things to do, and other values, etc. Of course, supply and demand really only makes sense when we understand how trade-offs work as mentioned above. Both of those principles mix together so that the world makes at least a little more sense in light of them. “Supply and demand” is how the market reacts to individuals who are themselves responding to their own individual incentives. Nothing is exempt from supply and demand. Elections, markets, regulations — they either account for it, or they have serious unintended consequences. 3. Scarcity. Almost Everything is Limited. We only have so much time on this earth. We only have so much intelligence. We only have so much oil. The same goes for gold, land, etc. Because scarcity exists, the question then becomes — how do we handle this scarcity? Pretending the scarcity doesn't exist can have huge consequences. In America, we see this mostly as an issue of consumer debt. In America, our government sees this happen almost always through federal debt. The leading cause of debt is people who refuse to accept that their financial resources are scarcer than they'd like. Once you understand scarcity, you're more likely to understand supply and demand. And once you understand supply and demand, you're more likely to know how to respond to choice by making the right trade-offs. Of course, these concepts are economic concepts, meaning they apply to way more fields than personal finance and investing — they also cover politics, psychology, and even moral behavior. That's why the study of economics isn't just the study of money — it's the study of human behavior in general. About the Author: Shaun Connell is the editor of Live Gold Prices, where he writes about the gold market, as well as the best ways to buy gold for consumers. For years, you have been able to access your credit report for free after being turned down for credit. Indeed, if you are turned down for a loan, the lender is required to let you know which credit reporting agency was used in making the decision to decline your application. Then, you have the right to request a copy of your credit report, in writing, from that credit agency (as long as you do it within 60 days of the rejection). Up until now, though, you only had the right to see your credit report. As of July 21, 2011, though, you will now have the right to see the credit score that resulted in your rejection. There are companies like Credit Sesame that can help you see a more general credit score. However, the score you see on a site like Credit Sesame, Quizzle and Credit Karma may not be the exact score used by a lender to make a decision about whether or not to lend you money. Thanks to this particular provision in the Dodd-Frank Wall Street Reform and Consumer Protection Act, you now have the right to see which credit score was used, and you will be notified of this by mail in most cases. Earlier this year, lenders were required to let you know if you didn't get the best terms, including the best interest rate, or a requirement to have a co-signer for approval. Credit scores didn't need to be included, though. Now, credit scores will be added to the equation. All of the information that the lender used when making the decision will be included on the notification, along with date of the inquiry, as well as which credit reporting agency was used to gather the information. Only those who didn't get the best terms, or were declined, will receive the notice (usually by mail). If you are approved, at the best terms, then you won't receive anything — unless the lender decides to provide the information or credit score to you. Some lenders actually use their own credit scoring models, and this will be disclosed in any letter informing you of rejection, or of the reception of less than favorable terms. Lenders have to let you know that they aren't using a scoring model based on FICO, and then provide you with the scoring range that is used. You can also call the financial institution to get more information about the credit scoring model so that you better understand why you were rejected. For years, consumers and consumer advocates have been complaining about credit reporting practices that keep borrowers in the dark about what information is being used to make decisions about their financial futures. The ability to see your credit score for free when you are declined is a step toward better understanding your total credit history. It also provides you with some of the information you need to make more informed decisions, as well as target financial habits that could use improvement. Are Your Priorities Truly Priorities If You Don’t Put Them Into Action? We live in a fast paced age, and our lives can become chaotic jumbles of competing interests and priorities. It can be hard to keep track of what things are truly important to us. People will talk about how this thing or that thing is their number one priority, and how they are working towards making it happen. We talk about wanting to lose weight, getting rid of debt or of finding a new job. Far too often, however, we don't follow through on the things we say are priorities, and things remain undone. Why is that, and are they truly priorities if they don't get followed through on? J.D. over at GetRichSlowly.org had a recent post in which he had a tangential story about priorities, and how we should truly define what is a priority. This reminds me of a conversation I had once with my cousin. I was complaining that fitness was one of my top priorities, but I couldn’t seem to get healthy. “That’s because fitness isn’t a priority for you, J.D.” Nick said. When we say something in our life is a priority, our actions should bear it out that it truly is a priority, and not just wishful thinking – or window dressing. Priorities are born out by the things we do – action. For example, for a while now I've been saying that one of my priorities – like J.D., was fitness. After reading his post and the quote above, however, I was a bit convicted because my actions – and the things I do – haven't backed up my claim that fitness is one of my priorities. It's a secondary thing lately. Our true priorities in life are shown by our actions. The things that we do and the actions that we take show what is truly important to us. For me my actions would show my priorities lie with my blogs, my family and possibly in some other lesser areas. Things that I have said are priorities, but haven't actually become that yet include my fitness goals, and some of my financial goals. It's time to take action. So for me the key is to examine your life and determine what things truly are your priorities, as opposed to the things that only sound good as priorities when someone else is asking. Find your true priorities and figure out how you can work towards making those things a reality. Is your first priority to lose weight and get fit? Join a program to help you towards that goal. Is your goal to get rid of all your consumer debt? Follow a program like Dave Ramsey's 7 Baby Steps, and start actually paying off the debt. Put your priorities to action – and make it truly a priority! Will The U.S. Default On Its Debt? President Obama and lawmakers are in discussions right now, trying to come to an agreement about what to do about the debt ceiling. If the debt ceiling isn't raised, the United States begins defaulting on its debt. Of course, we won't default on it all at once, and there are ways that the debt could, perhaps, be restructured. As August 2, the date that has been designated as the point at which we begin defaulting, approaches, many wonder what could happen if the U.S. cannot meet its obligations. Should The U.S. Declare Bankruptcy? Some think that the best course of action is to just announce that we're bankrupt, default on everything, and start over — hopefully with better money habits as a nation going forward. Others, though, point out that such a course of action would result in difficulties for us getting the revenue to start over. Borrowing at least some of our capital has been a reality since before the U.S. was a country. Our Founders didn't pay for the Revolutionary War entirely with money they had in hand; some of the funds were borrowed. Just like businesses rely on borrowing to get immediate capital for immediate needs, and then pay it back, the government operates on a similar principle. If we default now, we would pay a much higher interest rate on future debt. Our credit rating as a nation would tank. However, just as a person — or an individual — can get in too deep, the U.S. government has done just that; we have spent beyond our means, and the current deficit level is unsustainable. Avoiding a default by raising the debt ceiling is probably necessary right now, to avoid default. Once that is done, though, it's time for America to wake up and realize that the same money habits cannot be followed in the future. Serious, and painful, changes have to be made. No one wants to be the bearer of bad news, least of all politicians. No politician wants to say that spending cuts need to be made, and that taxes will need to be raised. Some would like to think that doing one thing or the other will result in fixing the deficit. Sadly, we're far beyond that point at this juncture. Someone who is badly in debt, and who is serious about getting out of debt, knows that there is a point at which only so many cuts can be made. The U.S. is probably at this point. The deficit problem is so big that no amount of cutting can fix the problem. We need to figure out our spending priorities as a nation, and make cuts to various budget items that don't fit the priorities. But we also need to raise revenue. An individual serious about paying down debt will find ways to raise more money, including taking on a distasteful second job. The U.S. is in that position. More money needs to be raised, and that means that taxes need to be raised. Fixing our current debt problem as quickly as possible means combining expense cutting with revenue raising — even if no one wants to acknowledge that with an election year coming up. If we do manage to get out of this mess, we will have to hope that, as a nation, we have learned a valuable lesson.